Photographs on a stairwell. So much easier than hanging every single photograph on a difficult to reach area. A simple, yet effective row of three prints. The shelf has been painted black to make this a feature and tie in with the rest of this gorgeous mid-century feel hallway. 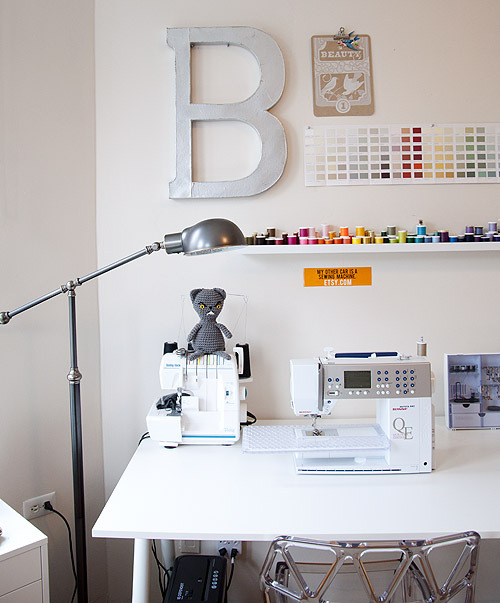 Styled shelves look good in this monochrome work space. 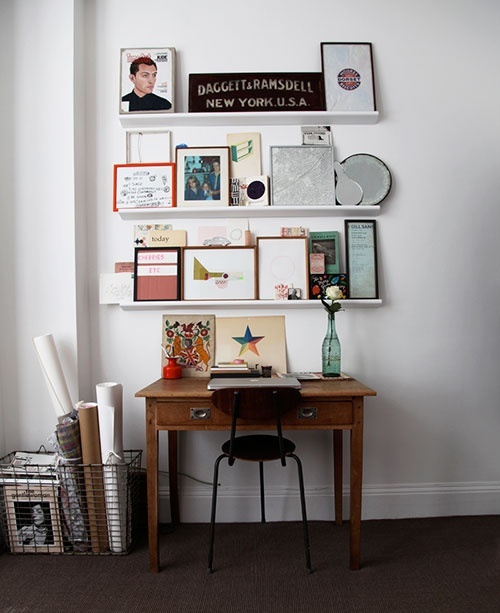 Above a desk and used for a number of different objects: Pictures, signs, mirrors, prints etc. 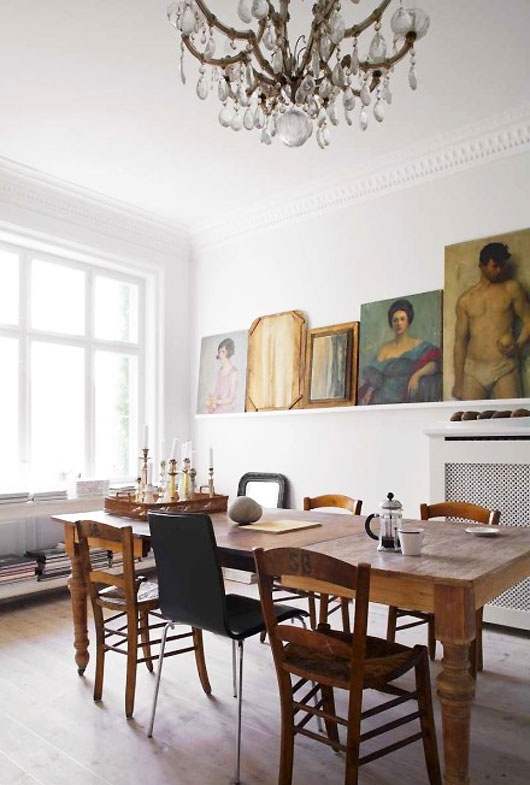 The over-lapping creates a modern, eclectic look. Wow. This scares me a bit! 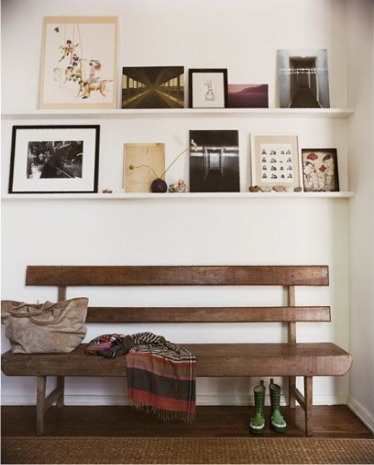 Far too neat and tidy but I like the idea of storing small objects that you need on a regular basis on this type of shelf. I like the idea of using this type of shelf to display work you have done with the ability to change it as you move on to different pieces of work. Could help with the creative process. 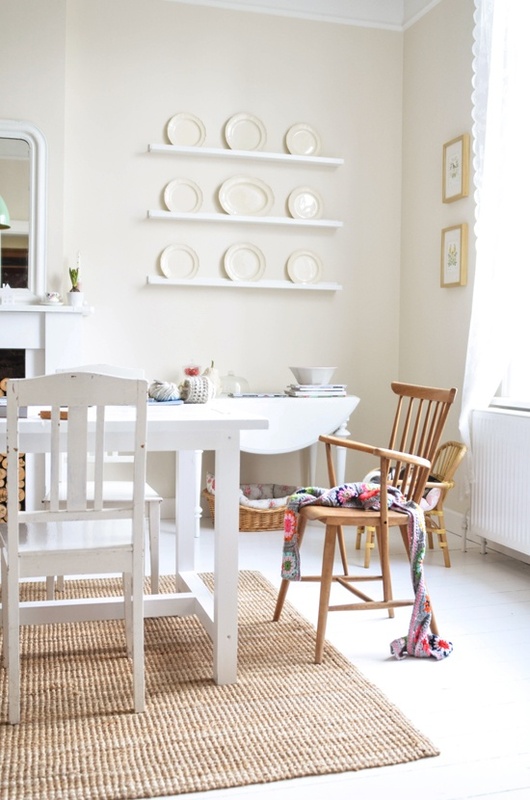 A very easy way of displaying plates and if you ever need to use one there is no hassle in taking it down and replacing it later. If you ever wondered where to put all the random prints, pictures, framed photos (we have quite a few stuck under a bed) these shelves allow you to put everything together to create a point of interest. 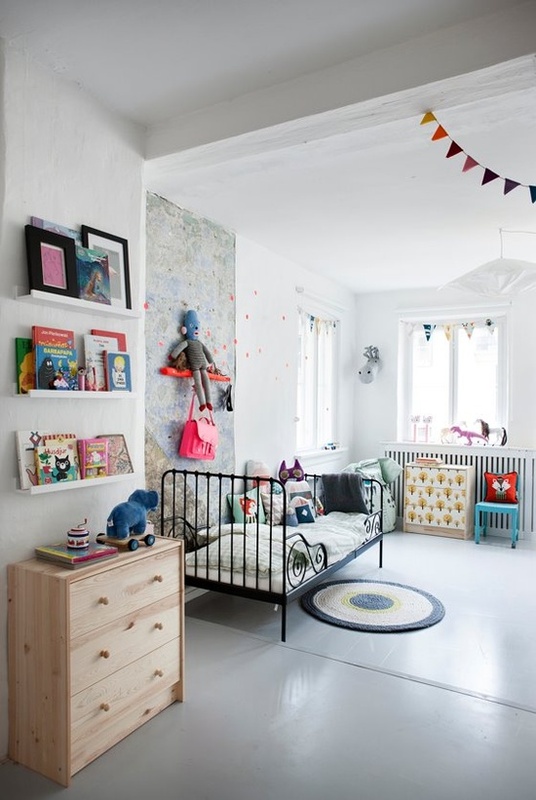 Use shallow shelves with a lip to display books in a child’s room. Use for magazines and books, not just pictures. 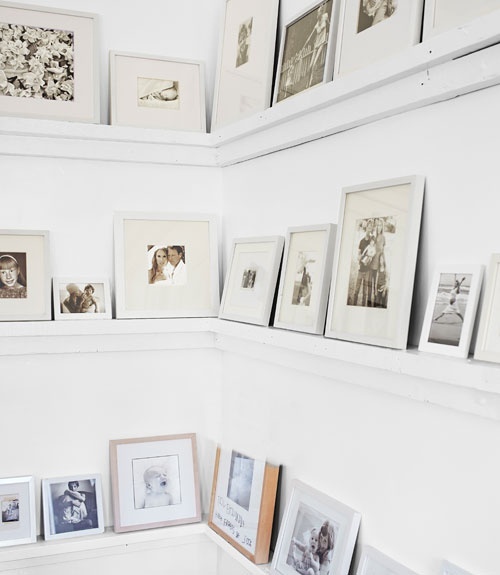 Love the way these pieces of art are grouped together, but with the flexibility to move them around when you get bored. 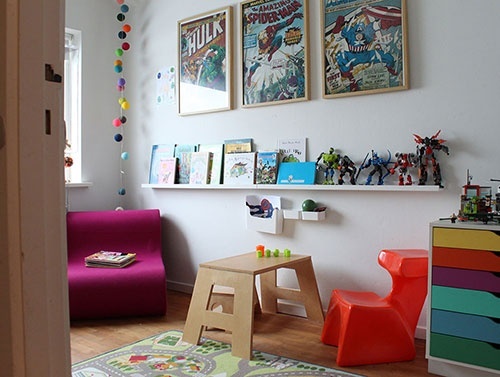 A space to display toys in a child’s room. This is the usually wasted space behind a door. Very clever. 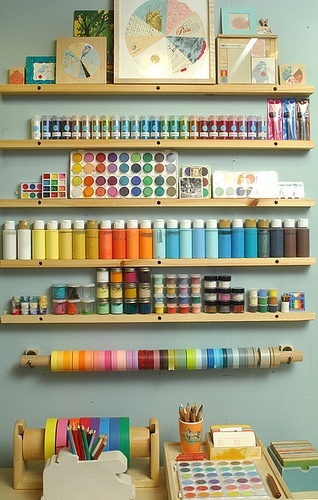 This shallow shelf has been used to store cotton reels. really love the look but would have to be really high with kids about! Definitely need to try this with herbs and spices so that they’re not all hidden behind each other and aren’t intrusive on kitchen workspace. Consider me inspired! Good idea! Send me a pic when you’ve done it. What wonderful ideas! 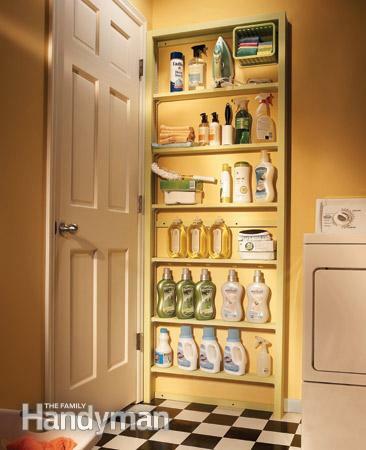 I love the shelves behind the bathroom – excellent use! These shallow shelves look fantastic! Thanks for sharing. If your audience fancies giving them a try, we sell products on our website that you can use to create these. Please use the discount code DISC25 to receive a 25% discount on your first order.